Stop for a second and imagine that you recently got married to your true love, believing that you will stay together for the rest of your lives and enjoy a lifetime full of love and attention. However, after 7 months of living together, a tragedy happens out of the blue… The love of your life is on breathing apparatus and you are told that the chances of recovery are too little. Imagining this tragic scenario is difficult, but the truth is that this really happened! On July 11th in 2011, Daniel Davis got a call from the hospital. She had been told that her husband Matt got in a terrible car accident while driving his motorcycle. 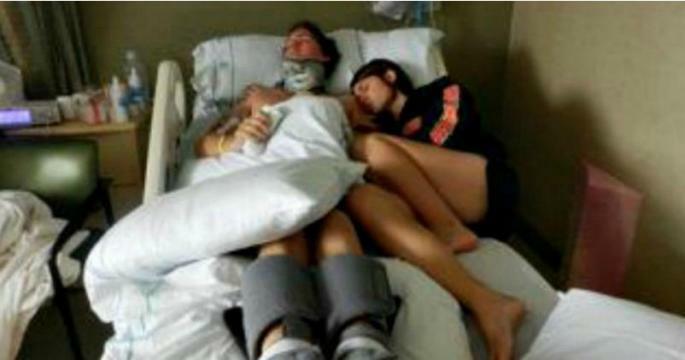 Despite the fact that doctors advised Daniel to give up as there is no hope, she refused to take him off the apparatus which had been keeping him in a coma. She visited Matt regularly and prayed all the time. As unbelievable as it sounds, after three years of praying and not giving up, Matt woke up. Then, he said something that Daniel will never forget: “I am trying”. As mentioned above, Mat had a car accident with his motorcycle and was severely injured. He had various fractures and a couple of injuries on the head. He was kept in a medically induced coma, unconscious and disabled. However, Daniel didn’t give up and always stood next to him. When she was told that nothing else could be done and that there is little or no chance that her husband will survive, Daniel had to make a life-changing decision. In fact, she had to decide whether to give up and take Matt off the apparatus or give up. Daniel later stated that the decision was actually very simple. “I knew that God will help us to get through this together. I believed that this was not a big deal for God,” she said.